These cauliflower steaks are pan-seared, and then roasted until tender. Flavored with garlic and dill, they’re a perfect hearty side or light main dish! Okay, I don’t know how you guys are going to react to this post, but I’ll say this: had I seen this post on another blog say, just a month or so ago, I’d probably had given it a quick glance and clicked away to something else. Yes, I’ve been quite the cauliflower skeptic. Cauliflower was on my list of foods to get to know for a while, but I just couldn’t bring myself to do it. I’d see blog posts being pinned away, commenters going on about drooling over the stuff, all kinds of unhealthier ingredients being substituted by incognito cauliflower, and despite logic telling me that there must be something to it, every time I passed the cauliflower in the produce aisle all I could think of was the soggy, drippy, boiled and flavorless little flowers that lived in broccoli’s shadow. I don’t know what possessed me to grab for a big old crown of cauliflower while food shopping last week, but it happened. Even after that it took me a few days to get around to cooking it. I just didn’t have the itch like I might get if I were to buy a few ripe mangoes or a pretty, purple eggplant, or something, anything, sexier than cauliflower. Eventually I decided it was time. I opted to go with the “cauliflower steak” method of preparation, having seen all kinds of variations all over the blogosphere. I figured garlic and dill would be a good flavoring, having the ability to de-blandify most foods. I got everything together, and one day last week begrudgingly stepped up to the stove. The result…oh my god. You guys need to make cauliflower. I never in a million years expected this. In fact, I tasted a loose little cauliflower bit as soon as I removed my skillet from the oven, saying out loud “Oh my god.” I could have easily eaten all four steaks, which would be an entire crown of cauliflower. They were that addictive. I could also see immediately on tasting why these are named “steaks,” I mean aside from the fact of being prepared in big slabs. They are quite steak like…hearty and satisfying from roasting, with just the right touch of crisp from pan searing. 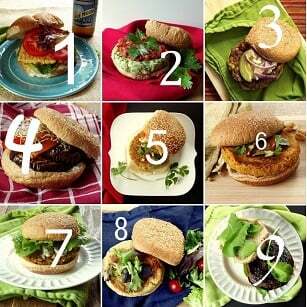 This post first published on Connoisseurus Veg on April 14, 2014. 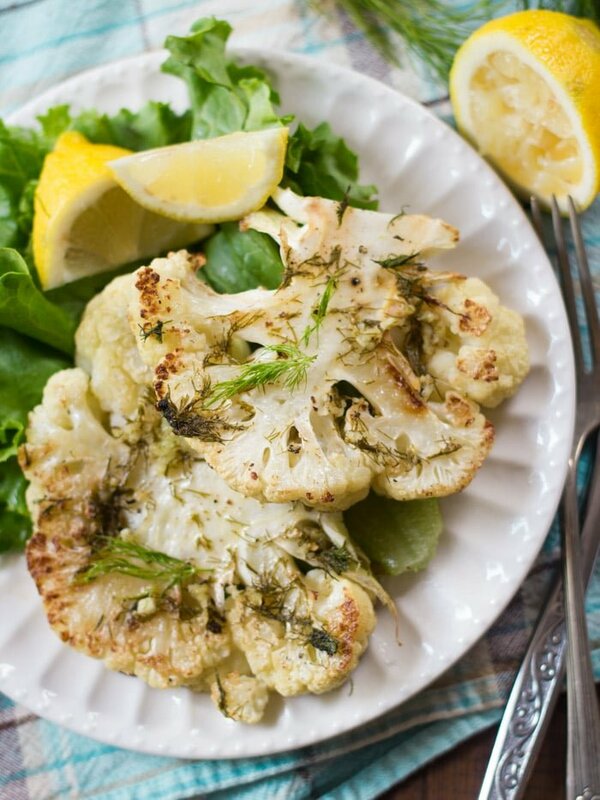 These cauliflower steaks are pan-seared, and then roasted until tender. Flavored with garlic and dill, they're a perfect hearty side or light main dish! Place cauliflower crown on a cutting board, stem side down, flower side up. Next, slice cauliflower into 4-6 steaks, each being about an inch think. Start by taking a big, sharp knife and cutting straight down, through the middle of the crown, so you've got two identical halves. Now make cuts into each of those halve, parallel to the original cuts and offset by about an inch. Repeat if you've got enough room for another slice, otherwise just stick with four slices. I ended up with four steaks and a few random florets, which I cooked along with the steaks for picking at. Heat 1 tbsp. olive oil in a large skillet over medium-high heat. 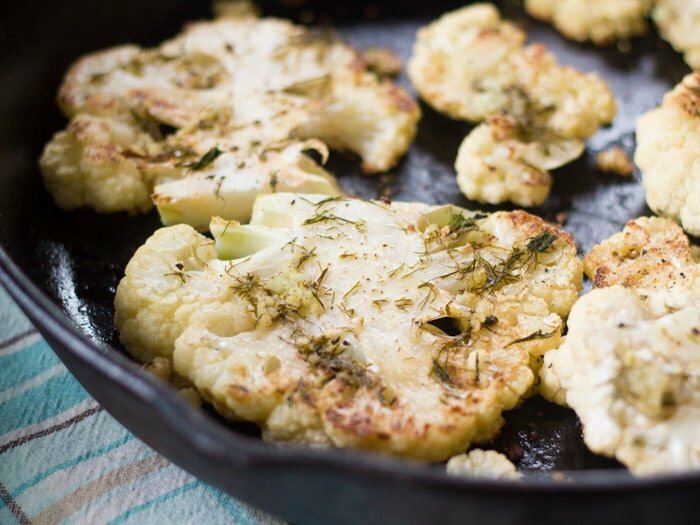 Arrange cauliflower slices in skillet and cook about 2 minutes on each side, until you've got some dark spots. Transfer cauliflower to a baking sheet. 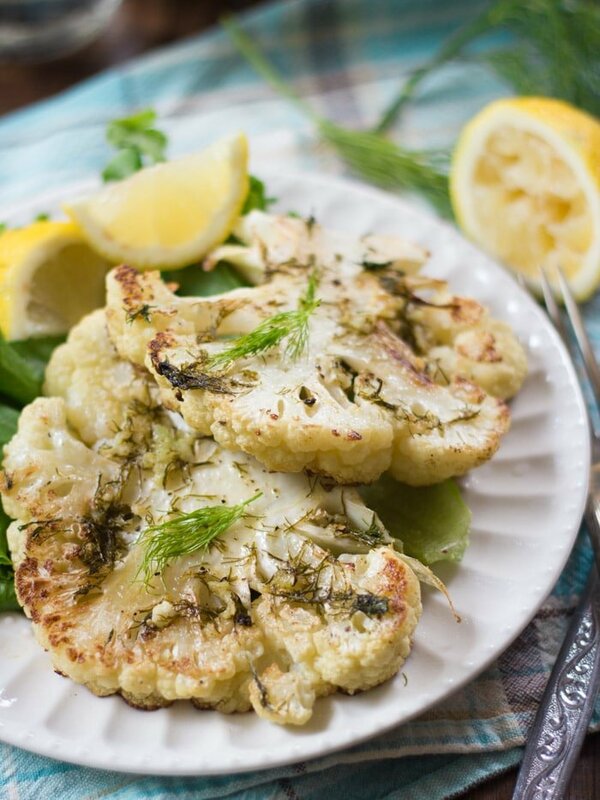 Stir remaining 1 tablespoon of olive oil, lemon juice, dill and garlic together in a small bowl, then brush or spoon evenly over cauliflower slabs. Sprinkle with salt and pepper to taste. Roast to desired tenderness, about 10 to 15 minutes. I made this tonight. My cauliflower fell apart, so nothat so much steak. But it was delicious, nonetheless. I’m not a fan of cauliflower, so I embrace any recipe where it other flavors cover up the cauliflower taste.